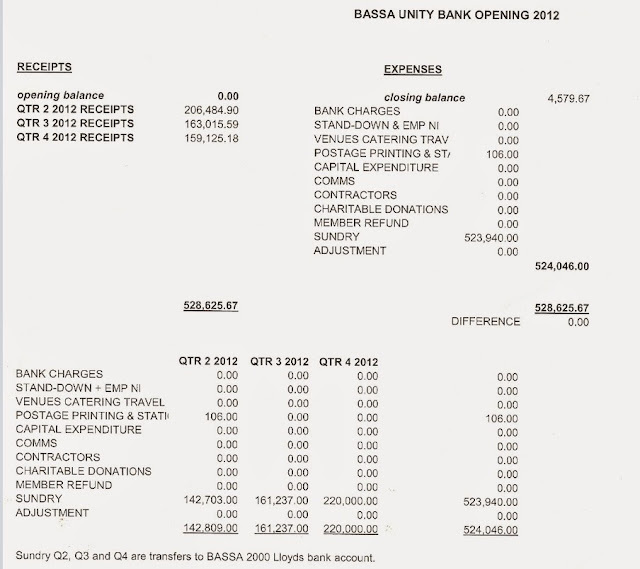 The claimant was exercising her right as a union member when she requested disclosure of the Branch’s accounts. It was not necessary to name and to target her in the Branch’s emails and in other communications in the manner in which the Branch did. 162. We have found that the change to the Branch’s constitution, the timing of the amendment and the way in which it was expedited, were targeted at the claimant. The Branch officials and that the Branch were anxious to implement the proposed amendment prior to the claimant inspecting their documents on 7 April 2017. There was a determination on the 3 April 2017. The branch officials only disclosed the nature of the proposed amendment on the day of the meeting on 3 April 2017. Out of the 9,000 members only 41 attended the meeting. The claimant was named in the proposed draft letter to be sent to her with the threat of disciplinary and/or court action should she breach the provisions in the amendment which were in themselves quite restrictive as they do not allow for the claimant to discuss the documents with her legal advisors. Accordingly, she has suffered a detriment as she was targeted, isolated from the membership and restricted in her use of the information. 75. It is difficult to understand why it was necessary to publicise the name of the claimant and the fact that she would be given copies of the BASSA Branch’s financial records. 78. We were very concerned that a private communication between the Branch and the claimant was circulated [by the branch] to its 9,000 members. composition of the emails sent to the members was a joint effort with everyone “chipping in bits and pieces” although he could not remember exactly who wrote what. He confirmed that the emails were all authorised by the Branch Committee. In our view the style and content of the emails suggests to the tribunal that they were written by one person. Also, they appeared throughout the month and not just for the first three days in the month when the Branch Committee would meet. Contrary to what Mr Beatty said the emails, in our view, went far beyond challenging the factual assertions made by those who they perceived to be working against the interests of the Branch. We find that the emails specifically targeted the claimant in ways which went beyond simply setting the record straight. 125. We find that there is some credence in the claimant’s assertion that, considering the speed with which the proposed amendment took place, that it was directed at her to restrict her use of the information as she was due to meet with the BASSA representatives on 7 April 2017. There is also the proposed letter the committee members agreed on 6 April 2017 that they were going to send to her threatening her with disciplinary action or civil action should she fail to comply with the proposed amendment. 127. 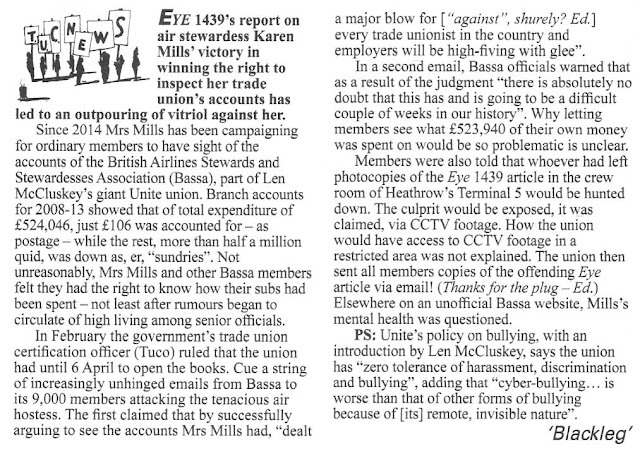 The BASSA Branch officers made no attempt to meet with the claimant to discuss her concerns and whether she had been involved in disclosing information about the Branch to the press and on social media. Instead what we have is an unhelpful dispute played out on social media in which she had clearly been singled out for unfavourable comment and criticism. 148. In the 14 March 2017 email the claimant was again referred to by name notwithstanding the fact that the Branch representatives accepted that she may not have been involved in disclosing information to the press. Her motives in calling the Branch to account were also questioned. 149. The emails were sent to the 9,000 membership and had the effect of isolating and blaming her for the lack of privacy protection afforded to trade union officers under the European Convention for the Protection of Human Rights and Fundamental Freedoms; for leaks to the press; for the weakening of the union, and for the weakening of the union movement. 151. 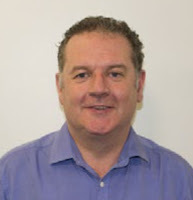 It is, in our view, clear from Mr Beatty’s evidence and from the above extracts that a determination was made on or around the 3 March 2017 by Branch’s union officials regarding how the claimant should be treated. This was in response to the negative press and rumours. Thereafter the documents referred to above are consistent with there being further determinations on how to deal with the claimant. These placed her at a disadvantage in that she was named when there was no need to do so and blamed for the alleged weakening of the unions. She was isolated and a target for attack for having to exercise her right to inspect the accounts under section 30. We are satisfied, having regard to section 65(5), that the claimant’s conduct was her requesting the disclosure of the Branch’s accounts. 152. 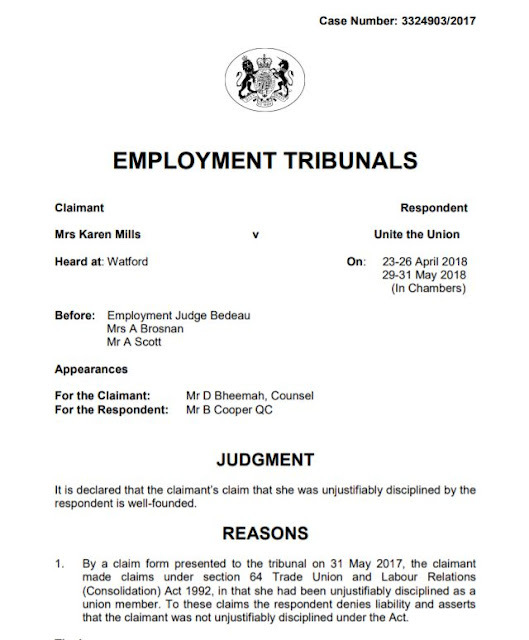 ..We are, however, satisfied that a determination was made on or around 3 March 2017 that she should suffer a detriment, in that the she would be identified and blamed for the consequences to the union and the union movement in having taken her case to the Certification Officer and the consequences for the union and officials considering the EAT judgment. 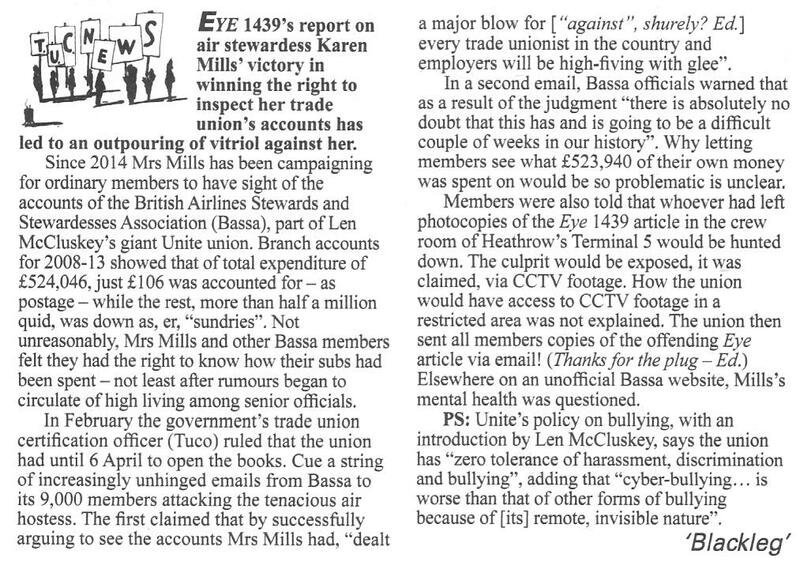 The email of 3 March, the Twitter tweet and the subsequent emails referred to above specifically referred to the claimant by name rather than as a member of the Branch or of the union. 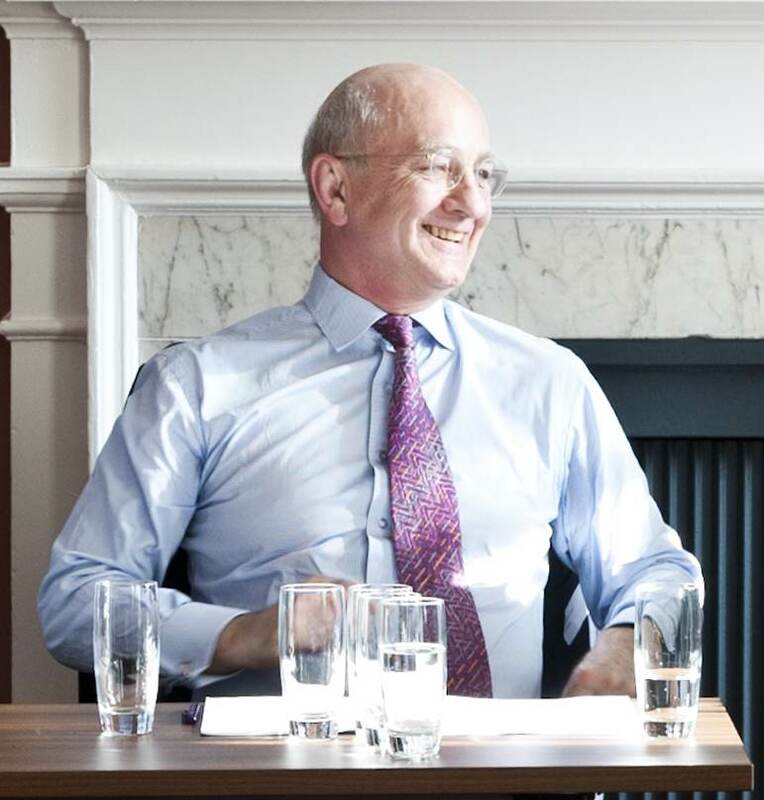 We, therefore, have come to the conclusion that the claimant had been unjustifiably disciplined in respect of the email communications from the branch. Each communication sent to the membership followed a discussion by the union officers and amounted to a determination. 158. The tweet on “Court Cases and The Public Record” on 4 March 2017, gave the link to the document circulated to the members on 3 March 2017 which referred specifically to the claimant and those involved in the Castillo v Unite case. Again, we conclude that this was a determination made by the Branch officers that the claimant’s case should be referred to in a tweet. This decision was a detriment to her as it further isolated her from her colleagues. We remind ourselves that the nature of the work of the BASSA involves travel all over the world and communication via social media is the principal means of keeping in touch and be seen as part of a team. We again would make the point that it was neither necessary nor acceptable for her to be identified by name and blamed for the alleged damage done to the union and the union movement. We have come to the conclusion that she was unjustifiably disciplined. £1/2 million 'sundries'. Per year. I have no idea whether the polls are right. Neither do they. Consider for a moment what they are trying to tell us: a month ago it was massive Tory landslide and Labour oblivion. They are used in public discourse as if they are tools of prediction, but all their predictions from April are now reversed. It's like predicting which team will win the league, and updating your prediction after every match. 1. Theresa May is a cardboard cutout politician with no depth or gravitas, held up by hot air spewing from billionaire owned newspapers and establishment broadcasters. 2. All Labour leaders get vilified. (Unless they actually get in bed with the Murdochs). Brown and Miliband were both subject to character assassination. Any of the bland weathercock 2015 candidates would have been (Cooper would have been portrayed as Mrs Balls, crashed the economy. Burnham would have been Mr U-turn, privatised the NHS, Kendall would have been shouty little girl). Angela Eagle or Owen Smith would have been mauled worse than Corbyn, given their dreadful media performances last summer. 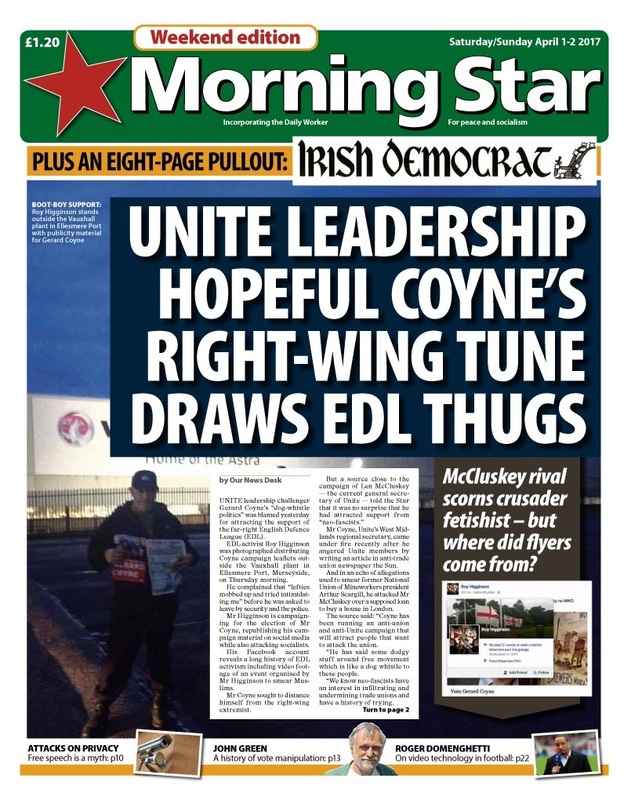 We should *never* base our politics or leadership choice on appeasing tabloids. 3. People actually like Corbyn once they get to see him, rather than hear second hand smears from his political opponents (of both main parties). His honesty and authenticity is an asset. These are personal qualities; compare with Diane Abbot: similar politics but comes across as a question dodger. 4. The most pernicious damage to Corbyn, which I hear every single time I go out door knocking, whether in heartlands or marginals, in Newcastle or around the region, is "but even his own side don't support him". The damage wasn't done by the Tories, people expect Punch & Judy politics. The damage was done by the dummy-spitting Mandleson crowd, Jess Philips, and Mirror and Guardian journalists. 5. The "hard left" "back to the '70s" policies of Corbyn and his supporters is neither of those things. The poll shift has finally put to rest the lie that a strong social democratic platform is unpopular. We released one and jumped ten points in the polls. 6. The size and strength of the Labour Party's grass roots does matter. Our ground activity and social media is having an effect. The Party establishment needs to nurture the members, not fear them. 7. If there is any kind of Tory government after the election we will certainly see a major economic slowdown in the next two years. We are currently bumping along with the weakest of recoveries based entirely on consumer debt and property speculation. Both are unsustainable and led to the 2007 crash. Factor in a hard Brexit and we'll see a grinding recession within 2 years. A clear Tory majority (20+) will see them ditch May with her toxic Brexit legacy and hold out to 2022. (She needs 50+ to hold on). A weak Tory majority will see increasing Brexit chaos and government defeats in Parliament, and the possibility of a vote of no confidence before 2022, with the probability increasing in direct proportion to their reduced majority. A Tory minority government will certainly collapse quickly, possibly even before the end of the Brexit process. Get your shoes on. Get your phones out. Every vote counts. Also read this: Won’t supporting Ian Allinson “split the vote”? The union strung out Karen Mill's inspection request as long as it could, with expensive lawyers, multiple Certification Officer hearings and finally an appeal against the Certification Officer's decision. They lost at every stage.